Left: Colors from left to right are Saddle Tan, Smoke, and Gold Topgrain Elk Leather. See below for more pictures. 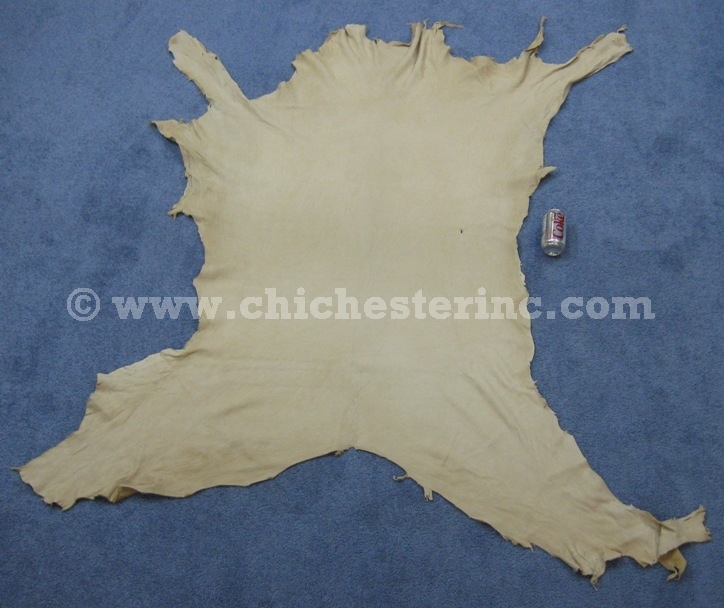 Right: A sample piece of Topgrain Elk Leather #2 Pearl. See size comparison with a soda can. The topgrain elk leather is sorted into three grades and are sold by the square feet. 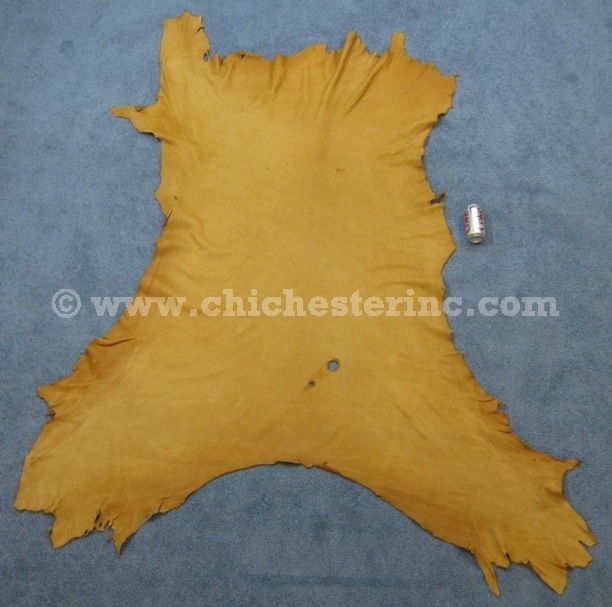 The topgrain leather averages between 23 to 25 sq. ft. per hide but may be larger or smaller. Order Code Description Price for 1-99 sq. ft. Price for 100+ sq. 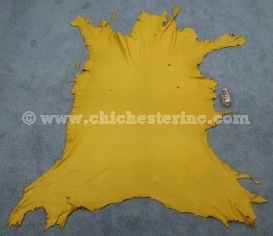 ft.
R-421-1-PG Topgrain Elk Leather #1 Gold US$7.95 / sq. ft. US$6.95 / sq. 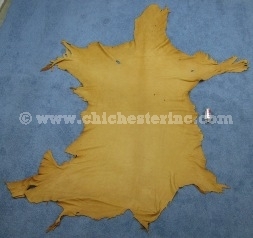 ft.
R-421-1-SD Topgrain Elk Leather #1 Saddle Tan US$7.95 / sq. ft. US$6.95 / sq. 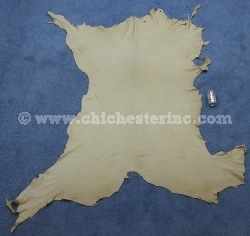 ft.
R-421-1-SM Topgrain Elk Leather #1 Smoke US$7.95 / sq. ft. US$6.95 / sq. ft.
R-421-1-TB Topgrain Elk Leather #1 Tobacco US$7.95 / sq. ft. US$6.95 / sq. ft.
R-421-2-PG Topgrain Elk Leather #2 Gold US$6.95 / sq. ft. US$5.95 / sq. 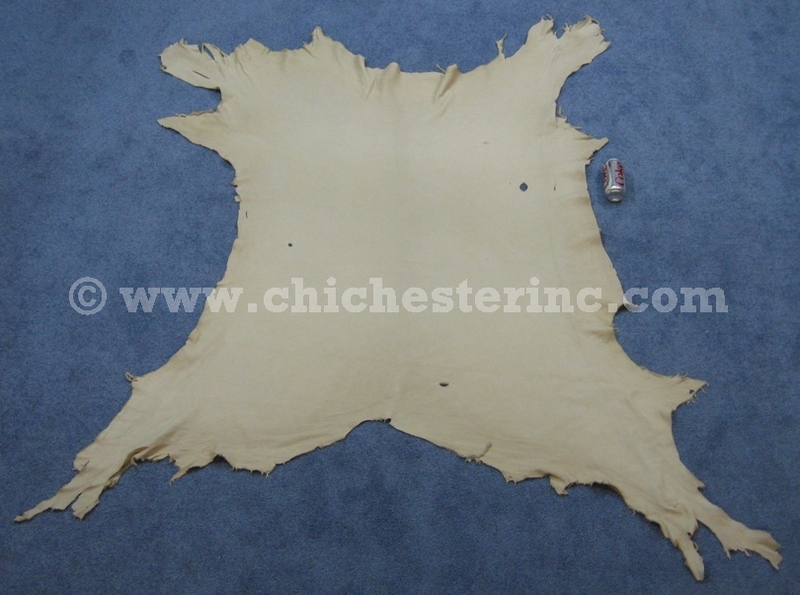 ft.
R-421-2-PL Topgrain Elk Leather #2 Pearl (undyed, blue tint) US$6.95 / sq. ft. US$5.95 / sq. 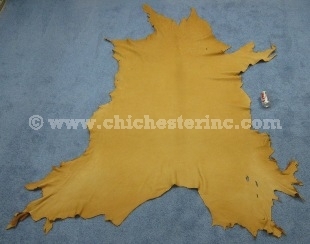 ft.
R-421-2-SD Topgrain Elk Leather #2 Saddle Tan US$6.95 / sq. ft. US$5.95 / sq. ft.
R-421-2-SM Topgrain Elk Leather #2 Smoke out of stock indefinitely US$6.95 / sq. ft. US$5.95 / sq. ft.
R-421-3-PG Topgrain Elk Leather #3 Gold US$5.95 / sq. ft. US$4.95 / sq. 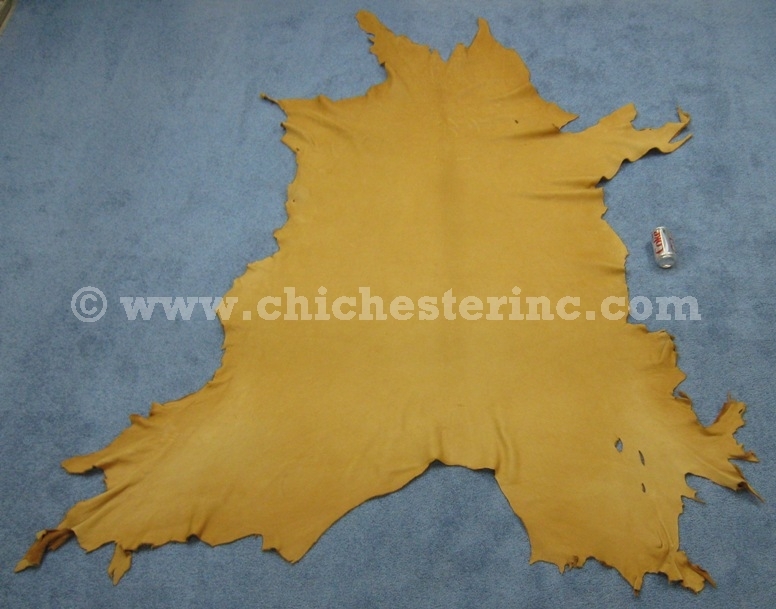 ft.
R-421-3-SD Topgrain Elk Leather #3 Saddle Tan US$5.95 / sq. ft. US$4.95 / sq. ft.
R-421-3-SM Topgrain Elk Leather #3 Smoke US$5.95 / sq. ft. US$4.95 / sq. ft.
Genus and species: Cervus canadensis. Wild. Elk are not an endangered species. 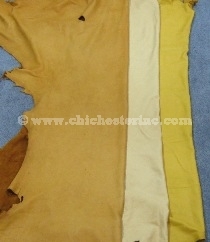 The elk are not killed just for their skins. 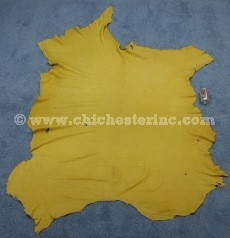 Here are some sample sizes and weights of a few random pieces of elk leather. 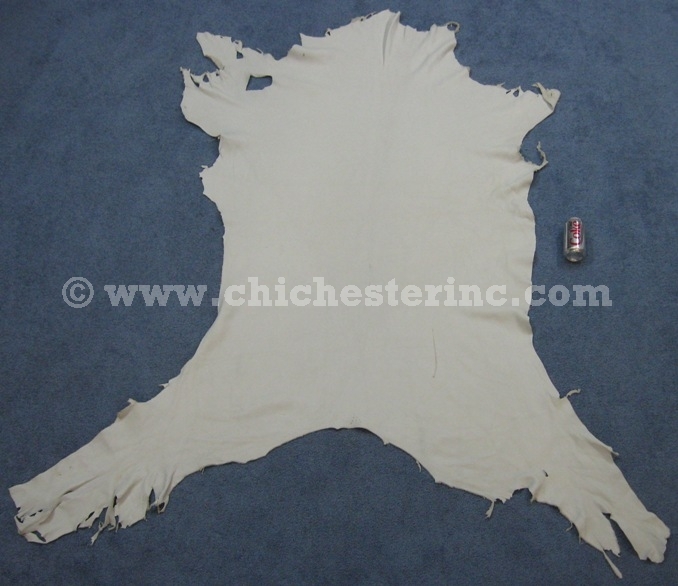 Sizes will vary for individual hides. These measurements are just to give you an idea of what we have. Topgrain #2 Gold 24 sq. ft. 68.5" 36" 42" 56" 3.64 lbs. Topgrain #2 Smoke 24 sq. ft. 49.75" 46.5" 43.5" 56.50" 3.32 lbs. Topgrain #2 Saddle Tan 27 sq. ft. 63.5" 37.5" 39" 65" 3.56 lbs. Topgrain #2 Pearl 19 sq. ft. 63.5" 38" 35.5" 51.5" 3.7 lbs. Topgrain #3 Gold 29 sq. ft. 62" 47.5" 53.5" 54" 4.10 lbs. Topgrain #3 Smoke 26 sq. ft. 61.5" 48" 37" 56" 3.62 lbs. Topgrain #3 Saddle Tan 32.75 sq. ft. 96" 49.5" 42" 60.5" 4.72 lbs. For hair-on Elk Hides, click HERE. 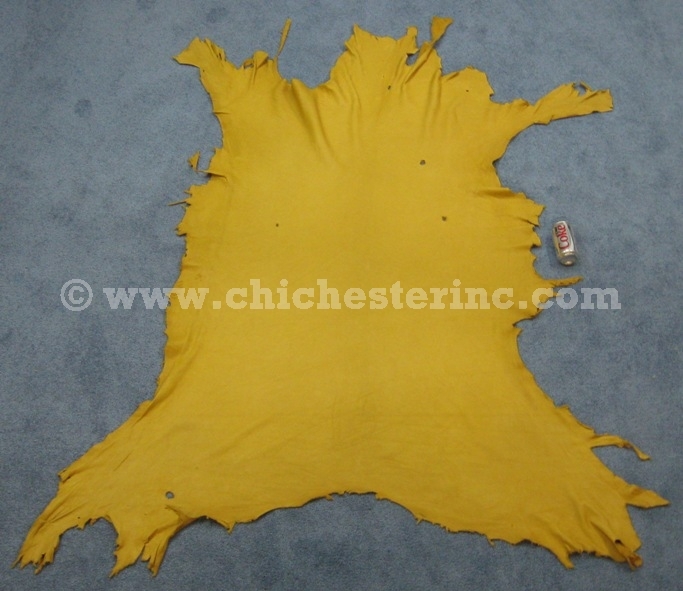 For Elk Leather Scrap, click HERE. 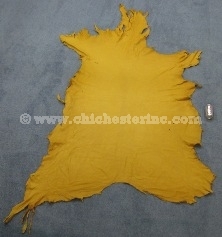 For other Leather, click HERE.